You can all look forward to a miniature sheet featuring cute Åland forest pigs to be issued by Åland Post on 1 November 2018. 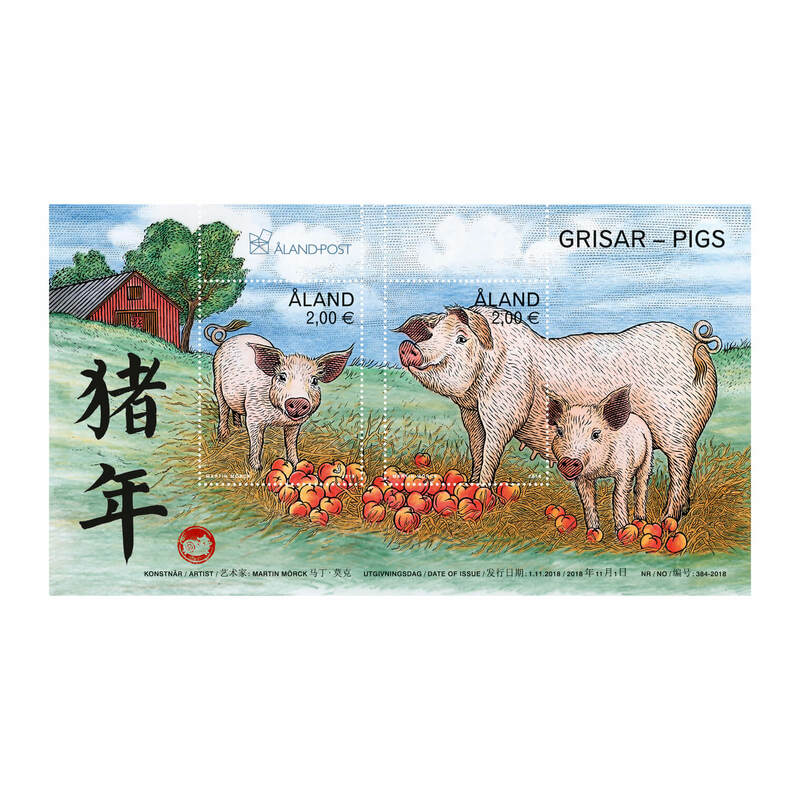 Once again, the highly skilled, Swedish stamp artist Martin Mörck has created the design that appears in good time for the 2019 Year of the Pig. “My years in China have given me greater understanding for the taste of collectors, and I’ve tried to interlink these preferences with an Åland perspective and my own style. I created the pigs as cute and communicating animals, a popular style there. I’ve also found inspiration from the photos I received from the Åland pig safari; they focus on the pigs’ intelligence and curiosity,” Martin explains. The forest pigs of Nygård’s pig farm in the village of Mångstekta served as models. The owners, Andreas Nordlund and Ronja Brenner, raise outdoor pigs for meat production and offer pig safaris in the summer. In the design, Martin has included pleasant little details for you to discover; illustrating the curly tails, the number eight also symbolizes happiness and prosperity in traditional Chinese culture, whereas the character for “fu” on the barn door symbolizes blessings, happiness and good fortune. 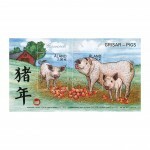 The Chinese signs for the Year of the Pig reappearing on the miniature sheet and maximum cards were formed by Zhen Jia Hong, a skilful Chinese calligrapher and popular stamp artist. ‹ Biscuit scented stamps in Iceland for Christmas!